I just got back from Austin and have a lot of work to catch up on so I've been busy. On top of that, I haven't had internet access at home since I got back, which is seriously impeding my ability to do, oh, just about everything. I hope have access soon because I need my online fixes. 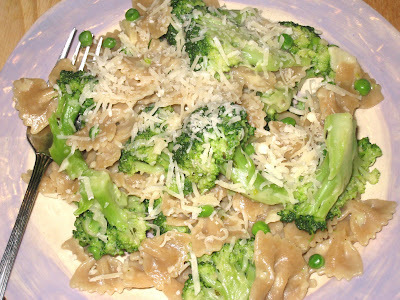 The most interesting thing about this dish is that I bought the broccoli a while ago, blanched it, used half of it right away, and then froze the rest for future use. It stayed in the freezer for at least a few months so I was curious to see how it would hold up when I defrosted it and put it to use. And it held up incredibly well; better, in fact, than most of the packaged frozen broccoli I have bought. It kept it's bright green color and I couldn't discern any difference in taste between the frozen and the half I used right away. All in all, a worthwhile experience. Not that I am going to start freezing all of my own vegetables. But I might certainly start buying and preparing more than I need so I can start freezing some of it for those nights when I haven't made it to the grocery store in a while and need some vegetables to liven up a meal. I can't remember if I have shared my technique for blanching vegetables with you, but it bears repeating. It works well with just about any vegetable and helps me keep from overcooking them in pasta dishes. I found this technique in a recipe from Giada De Laurentiis on the Food Network website and have used it to blanch just about any vegetable you can name. It's quick, easy, and foolproof. Bring a large pot of water to a boil. Wash, peel (if appropriate) and prepare vegetables by chopping into even-sized pieces (asparagus, green beans, and smaller vegetables like Brussels sprouts can be kept whole if desired). Once water is boiling, add about a tablespoon of salt. Carefully place vegetables into the pot, turn off the heat, and cover. Let stand for 4-5 minutes. While vegetables are standing fill a large bowl with ice-cold water (use ice if the water doesn't get ice cold). After the time is up, drain the vegetables and put them in the ice water to keep them from cooking any longer and so they will retain their color. Vegetables can be used immediately, placed in the refrigerator for a few days, or frozen in a freezer bag for a few months.